» Company » News & Events » Big Booty Judy (BBJ) is back for 2017 and ready to rumble! Big Booty Judy (BBJ) is back for 2017 and ready to rumble! The RYCO 24•7 and Hose Connections Inc. drag car fondly known as BBJ hit the Martin Michigan race track this past weekend for the first time this season. Owners and drivers, Dave and Ryan Hill (father and son) are back along with the entire race team to ensure BBJ puts on a great performance at every race she attends during the 2017 season. 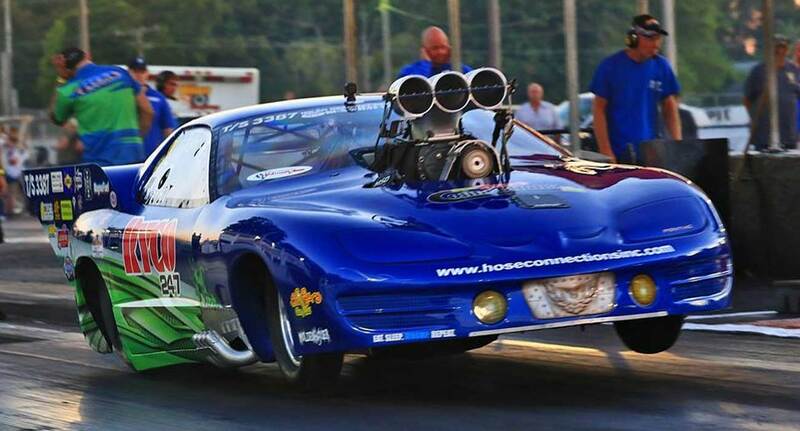 Just in case you do not recognize BBJ’s curves, she is based on a 2002 Pontiac Firebird and for those unfamiliar with this iconic American muscle car she is shaped like a wedge with a large rear end…hence the nickname that she is fondly referred to at every race she attends. While she may resemble the look of a Firebird on the outside, it also has to be said that looks can be deceiving as there is nothing on this car that is original. BBJ is a supercharged, methanol-burning door slammer capable of covering the quarter-mile in six seconds at over 220 mph.